Civil registration (the government registration of all births, deaths, and marriages) started in England and Wales on the 1st July 1837. However, failing to register a birth wasn’t punishable with a fine until 1874. In the early days of civil registration, it’s been estimated that as many as 15-20 per cent of births were never registered in some areas. Civil registration began in Scotland in 1855 and in Ireland in 1864. 4.1 What information is there on a certificate? Birth, marriage and death certificates contain varying amounts of information. Name, address and relationship to child of the person who registered the birth. Name, address and family relationship (if any) of the person who reported the death. Certificates can be ordered on line from the General Register Office: http://www.gro.gov.uk/gro/content/certificates. They will charge less if you are able to quote the GRO index reference (see below). 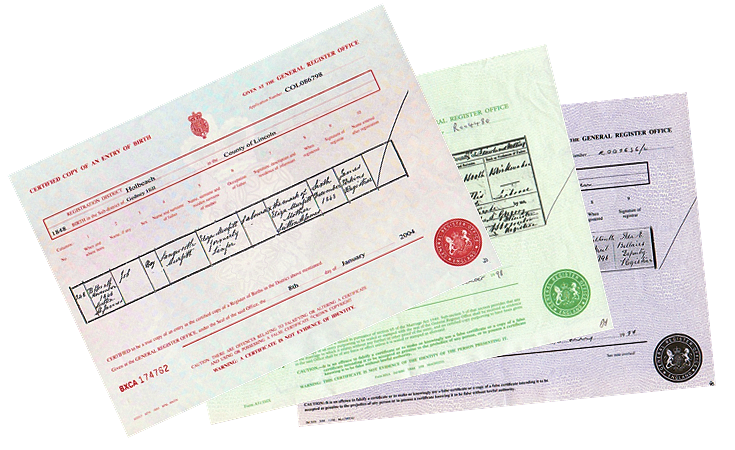 Birth, Death and Marriage certificates can also be ordered (in most cases) from English and Welsh Register Offices. You should make payments to ‘The Superintendent Registrar’ unless other instructions are given with the address. If the register entry is not at the office where you sent the application, they MAY forward your request to the correct office. Please enclose a self addressed envelope. Within the UK please send a stamped SAE. The General Register Office allocates a reference to every event of birth, marriage or death registered in England and Wales. This relates to the year, quarter, and district that the entry was registered in. By giving the GRO this index reference it allows them to quickly identify the correct entry and charge less for people who can quote the GRO index. This reference is only of use to the General Register Office and not to local registration offices, who have their own system. The GRO indexes are also available in some major libraries and on the Internet. FreeBMD is an ongoing project, which is transcribing the Civil Registration index of births, marriages and deaths for England and Wales, and provides free Internet access to the transcribed records. It is a part of the Free UK Genealogy family, which also includes FreeCEN (Census data) and FreeREG (Parish Registers). At present please note they have not yet transcribed the whole index. UKBMD www.ukbmd.org.uk gives guidance about other sites who have indexes of Birth, Death and Marriage certificates -like the excellent Cheshire BMD site www.cheshirebmd.org.uk site which covers Cheshire. These projects are being done by volunteers, you may wish to consider helping them.